Yeah, I could swear this photo is my brother at age 20. In fact, Rick might be everyone's brother at age 20. 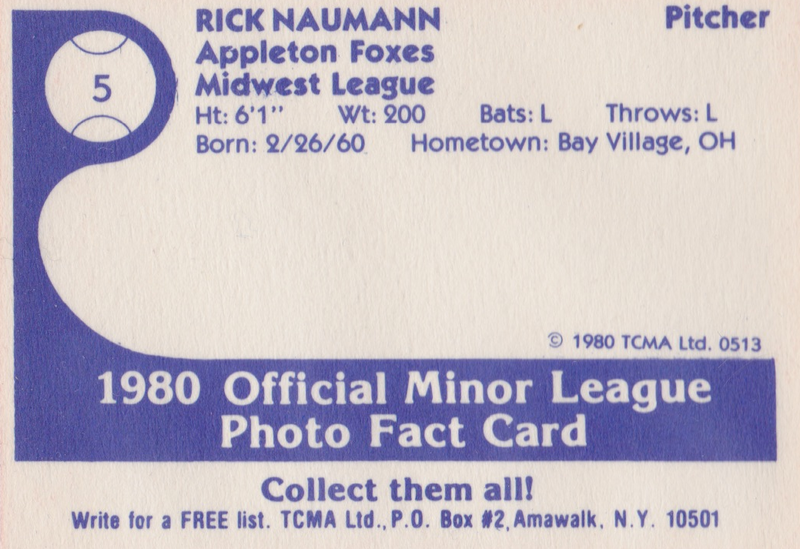 While Rick stands 6'1" and has many fine qualities, TCMA's card isn't calling him a foxy fox. Appleton, Wisconsin benefits economically (and bucolically) from the adjacent Fox River, which in turn inspired this team name. Their best-known alum might not even be a player, as future HOFer Earl Weaver spent his 1960-61 seasons in their dugout, winning a Triple-I league title and promotion to bigger successes with the Orioles. Like geographic neighbor Green Bay and its Packers, a community-run organization owns their franchise, which today plays as the Wisconsin Timber Rattlers. 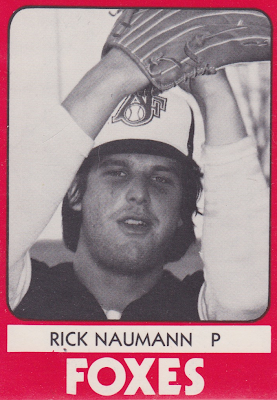 Naumann came to Appleton from western A-league teams, so maybe those stats proved too hard to locate. 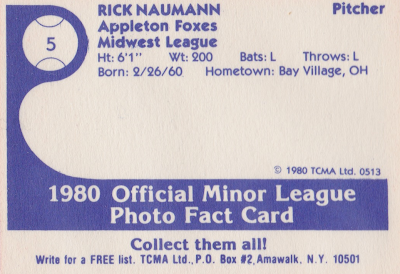 Rick played two seasons for the Foxes before hanging up his pro spikes at age 21 (career stats). TCMA printed a hefty 30 cards for this set. Perhaps Appleton splurged on players with their money saved by using black-and-white. Value: This TCMA set runs more than usual, thanks to the presence of slugger Ron Kittle. My #5 cost $2 and team sets go for $30 and up. Fakes / reprints: TCMA reprinted several of their 1980 teams for "collectors kits" in the late 1980s. Those cards have black ink backs. Originals are blue ink.